Brutal Power and Eagle Ridge are our runners at Sandown on Wednesday and both look to have good chances. Brutal Power (pictured) is the first to go in race two, the MRC Foundation Plate for three-year-olds over 1200m with Patrick Moloney to ride from barrier 10. The son of The Factor ran well to finish runner-up on debut at Geelong behind the highly rated More Sundays and has pleased Mike Moroney since. “I have thought about running him from the awkward barrier but he’s capable of doing it both ways,” Moroney said. 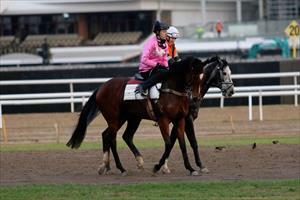 “He led all the way in his jumpout but we’ve been trying to teach him to relax a bit. “The soft ground should suit, his last piece of work was very good with an older horse so I’d like to think he’s there with a good chance. “If he needs to take a sit then so be it as he’s struck a particularly strong race but we’re close to the spring so it’s to be expected. Eagle Ridge runs in race six, the Ladbrokes Multiverse Handicap over 1600m with Lachlan King to ride and reducing his weight to 57.5kg. The son of Turffontein has run respectably at his last two starts in the city and Moroney is expecting another forward showing. “I’m very happy with him and he’s done well since his last start at Caulfield where he had no luck,” Moroney said. “He’s drawn ideally in four and I’d like to think he can get a nice run just behind the lead and away from the fence where he got stuck last start.